Render cleaning in Solihull by specialist wall render cleaning tradesmen using only low pressure cleaning equipment, sometimes referred to as wall render soft washing, including cleaning pebbledash finish. Don't be tempted to paint pebbledash, we can save you thousands. Cement renders and also K-Rend and Monocouche wall render products can be cleaned using our low pressure system. Solihull weather is wet and, and is getting wetter due to climate change, it has high humidity but our product and the method of application has been well thought out for all our conditions. All products are Eco friendly, no nasty bleaches or acids, and all products break down quickly in the environment. 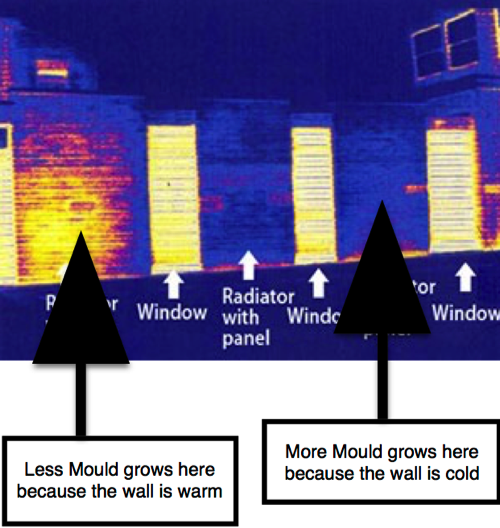 Below is a thermal image of a wall showing where internal radiators have had a heat shield fitted between the radiator and the wall, and that reduces the amount of heat being transferred to the fabric of the building. A rendered wall would be affected as the blue "cold" areas would remain colder and more damp and be more prone to mould growing in this area. We regularly see this problem on high rise buildings that are rendered where the concrete floor sections develop horizontal rows of black mould. So the black mould on the rendered wall is due to the concrete structural floor being much colder than the living/heated areas of the building.